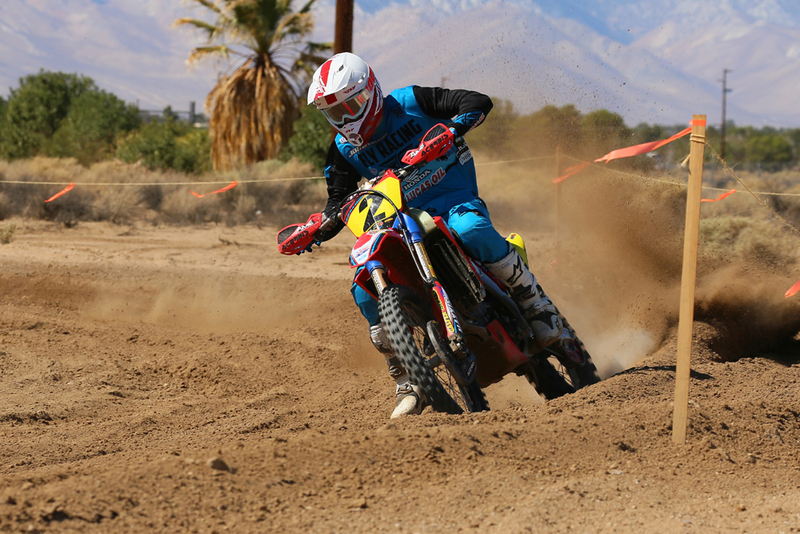 The AMA Big 6 West Coast Grand Prix (WCGP) championship returned to action after its summer hiatus with round six of the eight-round series taking place in Ridgecrest, California. 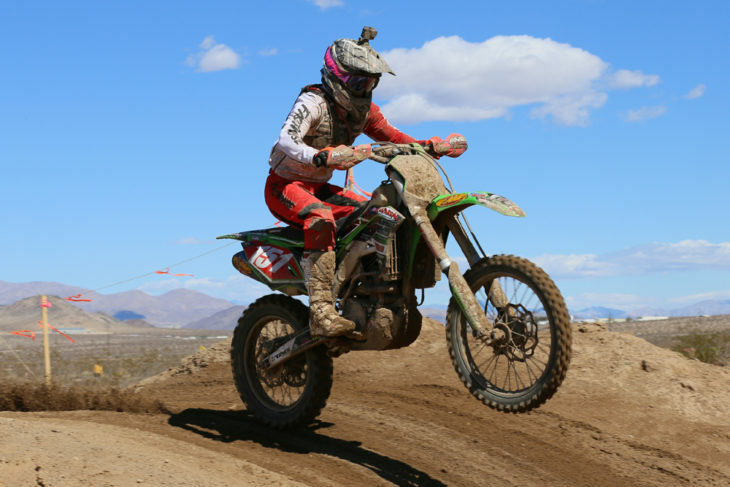 The Viewfinders GP was treated to cool fall temperatures and even a light shower on Saturday night for ideal conditions on the fast desert course for Sunday’s main event. JCR Honda’s Trevor Stewart put his CRF450R at the front of the pack early in the feature race and maintained the lead throughout the next hour and a half to take the overall win. It marked Stewart’s third win of the season, and places him firmly in the points lead with two rounds remaining. 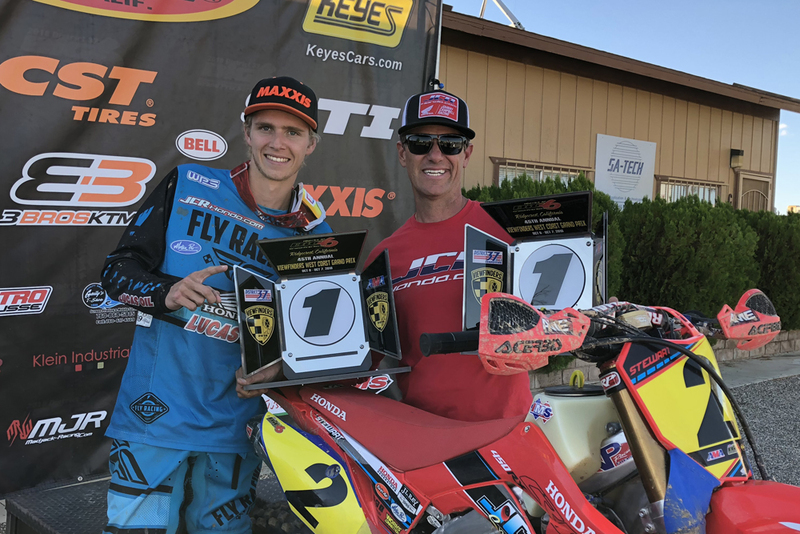 Stewart’s only challenge came from 3Bros./STI Husqvarna’s Zach Bell, who was determined to revive his championship hopes with a win in Ridgecrest, but Bell, who was admittedly tired from having raced WORCS the day before in Mesquite, came up short and crossed the line in second. Bell’s day quickly took a turn for the worse when he was issued a two-minute penalty for not stopping at the end of pit row, which dropped him from second to fourth in the overall. The penalty worked to Blayne Thompson’s advantage, the Chaparral Motorsports/Precision Concepts Kawasaki rider bumped up to second on the day after crossing the line third. Thompson was happy to make a return to the podium, though his day wasn’t without its difficulties. Chaparral Motorsports/Precision Concepts Kawasaki rider Blayne Thompson ended the day second overall. Rounding out the podium was Rockstar Energy Husqvarna’s Dalton Shirey, who was only informed that he’d made the podium after leaving the race. The Husqvarna rider dueled back and forth with Thompson, but ultimately came home third. Bell collected fourth ahead of Chaparral Motorsports/Precision Concepts Kawasaki rider Justin Seeds, who rounded out the top-five. 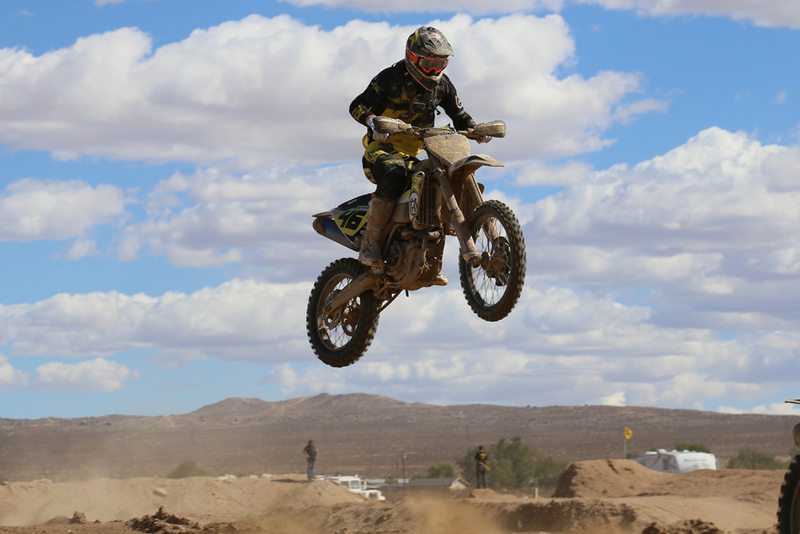 Dalton Shirey flies the blue skies at the Viewfinders GP, where he finished third aboard his Rockstar Energy Husqvarna. In the Pro II division, Clay Hengeveld and Mitch Anderson put on quite a show, keeping their battle tight, riding mere seconds apart for the duration of the race, with Anderson holding the advantage most of the way. On the final lap, Hengeveld was gifted the lead when Anderson’s clutch faded, causing him to blow a turn and allow the Northland Motor/Precision Concepts Kawasaki to sneak by. Anderson (CST/Precision Concepts KTM) had to settle for a disappointing second. Beta’s Chance Fullerton rounded out the Pro II podium. Clay Hengeveld (pictured) stole the Pro II win from Mitch Anderson on the last lap. The Women Pro class was full of excitement as well, but also some misfortune for top rider Brandy Richards. The ever dominant Richards quickly moved into the lead and began to build a gap over second-place Tarah Gieger (JCR Honda), but was forced to retire early with a mechanical issue. With that, Gieger inherited the lead and held it to the finish over Factory KTM’s Kacy Martinez Coy. It marked Gieger’s first-ever Big 6 GP win in only her third attempt. “Brandy’s got my number pretty much at every race, but this race she had a bike malfunction,” said Gieger. “But I was keeping her honest for a little bit. It was a fun track. I’ve never ridden here before. I heard they water it good and they definitely did. It was nice the first few laps and the track held up good. 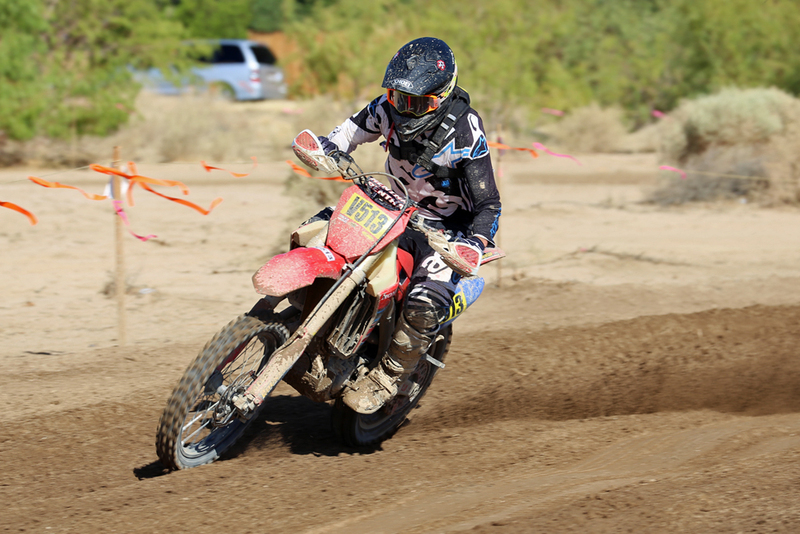 JCR Honda’s Tarah Gieger decided to race the Ridgecrest WCGP Big 6 in preparation for the ISDE in Chile. She came away with her first-ever Big 6 win! Another ISDE participant looking to get some seat time ahead of the November event was Kendall Norman. The desert specialist decided to try out a Big 6 Grand Prix, and as a warm-up to Sunday’s feature race, he lined up for the Saturday morning Vet race, which he promptly dominated. Norman took on the WCGP Pro race and finished seventh–a respectable top-10 finish in a stacked field. Kendall Norman’s return to racing continues! With some help from Johnny Campbell, Norman won the Vet race and also scored a top-10 finish in the WCGP Pro class. Other big winners on the weekend included Mikayla Nielsen. 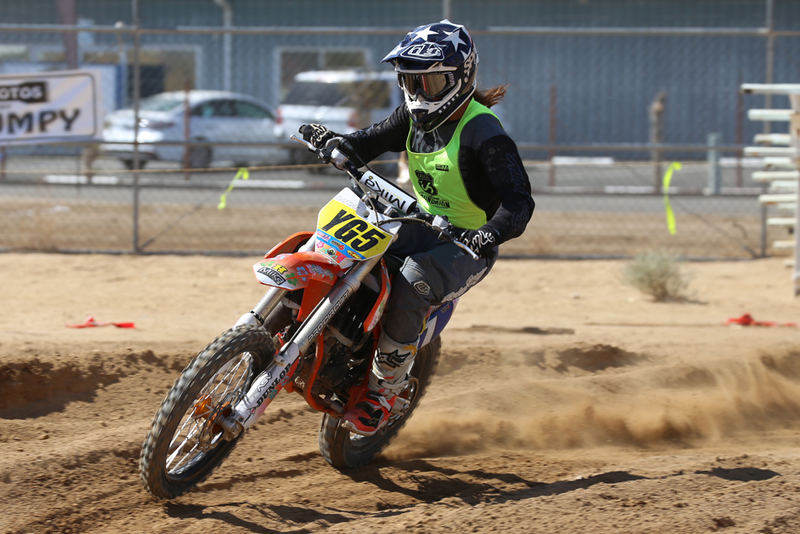 The young KTM rider was a sight to behold in the Saturday morning’s Women AA/Mini/Legends/Vintage race, which she overalled aboard her KTM 85. “KK” then went on to smoke the field in the WCGP Girls Jr./65/Pee Wee race a few hours later. At only 13 years old, Mikayla Nielsen is already smoking fast. She overalled both races she entered on Saturday aboard her KTM 85. Blayne Thompson topped the field in the Saturday afternoon Heavyweight/Lightweight race, taking the AA Heavyweight win. JP Alvarez was the top WCGP AA Lightweight rider while Jordan Gamboa took the Heavyweight Expert win. In the Senior division (40+), Richard Pratt took the overall ahead of Steve Roberts and Robert Baehr. In the Magnum (50+) race, Baehr also rounded out the podium, this time behind winner Tony Bienert and Craig McCall. 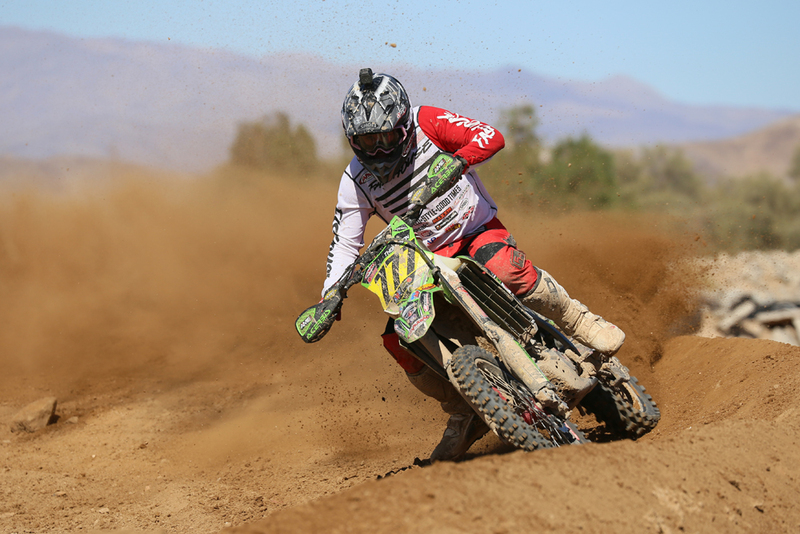 The Big 6 West Coast Grand Prix series picks up on November 3-4 at Quail Canyon MX in Gorman, California where the Prospectors MC will host round seven of the eight-round series. With two pro wins over the weekend from Trevor Stewart (left) and Tarah Gieger, it was a good day to be Johnny Campbell. But when is it not? Jean Turner | Contributor A former staffer at Cycle News, Turner continues to contribute to the website and magazine as a columnist and someone we can count on to whip up a few thousand words on an off-road race when needed.